This year they prepared some new ideas for the event "Ningen Shogi". At first they made a scenario as an occasion of the Warring State Period (Middle Ages). There were some mini-events still now, Japanese traditional drum performance, Japanese traditional dance performance, etc. And they held the "Ningen Shogi" as a main event. But this year, they regarded all events as an story. They showed you a scene of the Middle Ages in Japan. 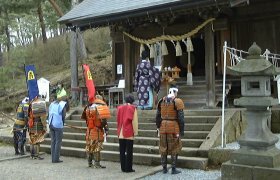 At first day, they held a praying ceremony to win at the "Takeisao" shrine, west slope of Mt.Maizuru. "Takeisao" shrine is one of famous shrines in Tendo because it is a place cennectionned with ODA Nobunaga, famous Samurai (same as western knight) in Japan. About this ceremony, they wrote down that both team take part in this ceremony at the leaflet of "Ningen Shogi". 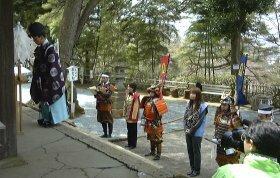 I expected that that was very magnificent ceremony, but only a few persons took part in this ceremony, both professional women shogi players and samurai as "Oushou" (same as King of chess) and samurai as shogun (same as general). I hope that they will hold this ceremony with all samurai next year. 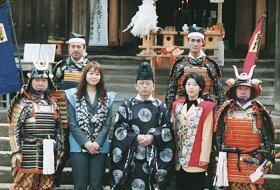 Woman with red cloth, right side of a shinto priest, is Ms.Ichiyo SHIMIZU with the title "Jyoryu Oui" and "Kurashiki Touka". And woman with blue cloth, left side of a shinto priest, is Ms.Youko FUNATO with the grade of 1st Dan. Samurai at the both edge performed as the King. They were ordinary persons, they took part in this event for themselves.